The Sacramento region was designated nonattainment for two out of the six criteria pollutants: ozone and particulate matter - 2.5 microns (PM2.5). Consequently, our air quality plans are focused on these pollutants. The Sacramento region currently meets the National Ambient Air Quality Standard (NAAQS) for the remaining criteria pollutants: carbon monoxide, lead, nitrogen dioxide, sulfur dioxide and particulate matter – 10 microns (PM10). Maintenance plans for carbon monoxide and PM10 are still required and are discussed below. Information on the air quality standards and attainment status for each of these pollutants can be found here. The federal Clean Air Act (CAA) requires plans to identify how nonattainment areas will attain the NAAQS by the attainment date. Key elements of these plans include emission inventories, emission control strategies and rules, motor vehicle budgets, air quality data analyses, modeling and air quality trends. EPA reviews air quality plans to make sure they are consistent with the requirements of the CAA. 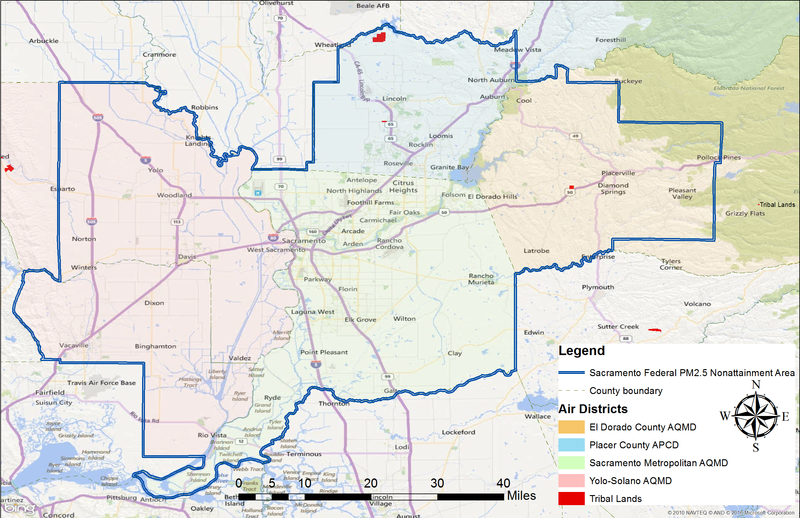 The Sacramento ozone planning region, see map, includes all of Sacramento and Yolo counties and portions of Placer, El Dorado, Solano, and Sutter counties. The region was classified as a severe nonattainment area for the 1997 8-hour NAAQS of 84 ppb. In 2013, the regional air districts developed the Sacramento Regional 8-Hour Ozone Attainment and Reasonable Further Progress Plan to address how the region would attain the 1997 8-hour standard. This plan was approved by U.S. EPA effective March 2, 2015 (80 FR 4795). Sacramento Regional 8-Hour Ozone Milestone Report (2011) This report demonstrates how existing control strategies have provided the emission reductions needed to meet the federal Clean Air Act requirements for reasonable further progress toward attainment of the 1997 8-hour NAAQS. Sacramento Area Regional Ozone Attainment Plan (1994) This report shows how the region attained the 1979 1-hour ozone NAAQS. The districts of the Sacramento region developed the attainment plan in November 1994. 1-Hour Ozone Attainment Determination Request for the Sacramento Federal Ozone Nonattainment Area (2010). A request for supplemental information was prepared and approved by the board, submitted to the USEPA but never acted upon. The USEPA asked that the request be updated under the redesignation substitution guidelines for the 2008 NAAQS. A Redesignation Substitution Request for the 1979 1-Hour ozone standard was prepared and approved by the Sac Metro Air District Board and submitted to CARB in October 2017. CARB will forward this request to the EPA. Exceptional Events Demonstration for High Ozone in the Sacramento Regional Nonattainment Area Due to Wildfires (2011) This report demonstrates how wildfires contributed to high ozone concentrations in 2008. The Sacramento PM2.5 planning region (see map), was classified as attainment for the 2012 annual average PM2.5 NAAQS of 12 μg/m3, and classified as nonattainment in 2009 for the 2006 24-hour PM2.5 NAAQS of 35μg/m3. The region prepared the PM2.5 Maintenance Plan and Redesignation Request (2013) to address how the region attained and would continue to attain the 24-hour PM2.5 standard. The region attained the standard based on 2009–2011 monitoring data, but postponed the submittal of the plan because of high concentrations in 2012 that caused exceedances. On May 10, 2017, EPA found that the area attained the 2006 24-hour PM2.5 National Ambient Air Quality Standards (NAAQS) by the attainment date of December 31, 2015 (82 FR 21711). This finding was based on complete, quality-assured and certified PM2.5 monitoring data for 2013 – 2015. The PM2.5 Maintenance Plan and Redesignation Request will be updated and submitted in the future based on the clean data finding made by the EPA. The particulate matter planning region includes all of Sacramento County, the eastern portion of Yolo County, the western portions of El Dorado and Placer counties and the northeast portion of Solano County (map). The Sacramento region was classified as attainment for the 1997 PM10 24-hour NAAQS of 150 μg/m3. In October 2010, the Sac Metro Air District prepared the PM10 Implementation /Maintenance Plan and Redesignation Request for Sacramento County (2010). EPA approved the PM10 Plan, which allowed EPA to proceed with the redesignation of Sacramento County as attainment for the PM10 NAAQS. The first Maintenance Plan showed maintenance from 2012 through 2022. A second plan must provide for maintenance of the NAAQS for 10 more years after expiration of the first 10-year maintenance period. The Sac Metro Air District will prepare and submit a second maintenance plan in 2020 to demonstrate maintenance of the PM10 standard through 2032. The Sacramento region is currently designated attainment for both the 1-hour NAAQS of 35 parts per millions (ppm) and the 8-hour standard of 9 ppm. A maintenance plan was developed for CO in 1996. The 2004 Revision to the California State Implementation Plan for Carbon Monoxide extends the 1996 CO maintenance plan demonstration to 2018. To obtain a copy of plans previously adopted by the region, reports or supporting documents, please send a request by email to sacsip@airquality.org.